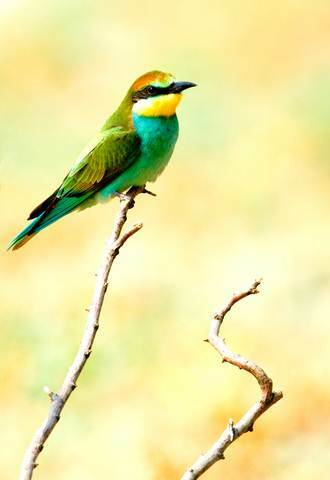 if considering a bird watching holiday in the Algarve one of the best people to contact is Simon Wates the Algarve Birdman. Simon operates out of Lagos in the western Algarve on the Sagres Peninsular famed for its rich nature and some of the finest woodlands on the Algarve.Here also are the varied wetlands and a short trip takes you to the rich habitats of the Alentejo where can be found some of the best Ornithology on the Iberian Peninsular. "Simon is able to get you in contact with all the bird life of this wonderful region,with information on the local flaura and fauna.His depth of knowledge will give you the best chance of seeing even the most elusive species of birds on his guided tours. Simon can also offer trips and short breaks into other parts of southern Portugal and into Spain,where his knowledge is equally advanced". 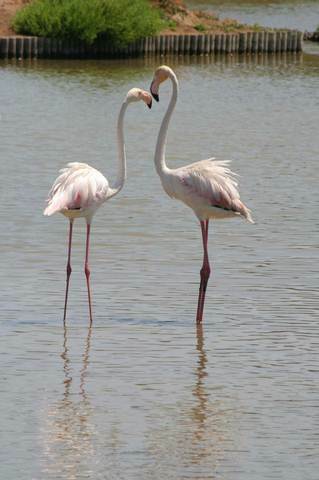 Below: Two magnificent specimens of the Pink Flamingo species "fishing for their tea!". Hundreds of Flamingos will make this their home untill April time.This region known to some as the River Guidiana delta region is around 2000 square kilometers for the birds to spread out in this natural haven.Bird watching can be carried out by boat on the myriad waterways,on foot or even by hiring a bicycle. This area is classed as one of the most important river-ocean wetland areas in the whole of Europe.The local authorities go to great lengths to make certain the reservation area is disturbed as little as possible by enforcing strict marked pathways which all visitors must stick on.These trails vary between 2 and 10 kilometers in length and they wend around the nature reserve passing by ancient eathen ramparts which surround salt works which are believed to date back to Roman times.Salt is still an important export commodity from Portugal and salt pans can be found in most coastal regions of the Algarve. Bird watchers and wild life enthusiasts should be careful of these trails through mudflats,salt water ponds and brack water in the blazing summer months.There is nothing to provide the unwary traveler with vital shade in weather of 35-45 degrees centigrade.Apart from the heat it should not surprise one to know that the birds themselves do not frequent these areas in the the summer sun. 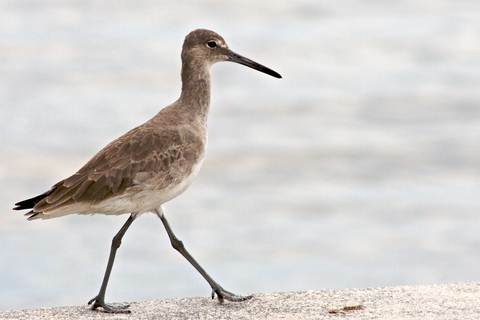 The main season for bird watching is Autumn,which in the Algarve you are talking late september at least before those high temperatures start dropping a little.Once the birds start arriving the mudflats can become a noisy place as the crowds start fighting over clams and snails.Indeed they will break into battle mode to protect their turf from marauders. Of course the most noticeable birds are the flambouyant flamingos arrogantly strutting around their neting domains and standing for long periods on one leg,for no other reason than,'because they can'.Alongside the flamingos can be seen,sandpipers;storks,avocets;spoonbills;grey geese;seagulls in variety and even osprey can be spotted going about their own business. The Ria Formsa Natural Park. The Ria Formosa which lies further west between Tavira and Faro is another vast haven for birds to practice Ornithology.This is a vast eco-system of major european importance and is a sub-land of sand dunes:islands;lagoons and narrow sanspits by there thousands.Being an estuary formed by numerous rivers it is very fertile and an ideal breeding ground for all types of creatures both great and small. History tells us that this rich area was created during the the devastating earthquake of 1755 and was turned into a nature reserve back in 1987.Not only is this a vast paradise for aquatic birds but is also the breeding ground for much of the Atlantic fish population.Apart from fish breeding there are also oyster beds and breeding grounds for clams.You will find the local people out and about filling their food cupboards and scraping a living supplying seafood to the local eateries,of which there are a great many..
Below a Sandpiper on the beach. "Strutting his stuff".Lost in its his own "self importance". "They come from all around the world to take my picture". 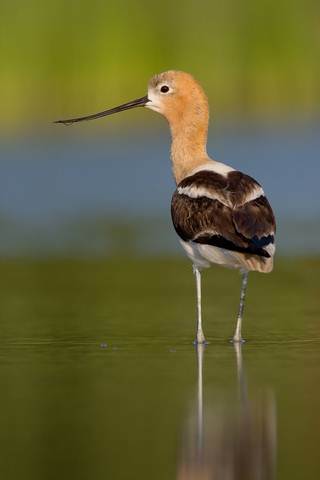 In the East Algarve there is a birdwatching tour company called, Algrve Bird watching.You can book day trips with them in the Ria Formosa and I believe they cover Castro Marim as well.They say,"We gauge a tour’s success not by the birds seen or the revenue generated but by the smile on your face at tour’s end. Tours are not scientific expeditions—they are vacations. We never forget that the quality of your experience comes first." They believe in giving the best possible service possible to their clients.One does not have to be an expert in Ornithology as they will help you develop the necessary skill sets and they say..."we can help you develop your skills. You just have to enjoy and want to observe the many beautiful and fascinating birds, not to mention all the other wildlife, fabulous landscapes, we see along the way. "They offer personalised guided tours with an enthusiastic 'Birding Guide' and try to keep to small groups whenever possible so you get maximum attention.If the group agrees they will organise stopovers in any of the lovely Algarve villages that you pass. I think you will struggle to find better people to introduce you to bird watching.